Two prominent Christian leaders, Gregory Lahham III, former Melkite Patriarch of Antioch, Alexandria and Jerusalem, and Archbishop Atallah Hanna of the Greek Orthodox Church in Jerusalem, joined in solidarity with the Palestinian prisoners as did many other people of faith around the world. Patriarch Gregory, who is 83 years old, said in an interview with Al-Mayadeen TV, “I say to the prisoners, we are with you in your sacrifice for Palestine.” Archbishop Atallah, said the prisoners’ cause is the “issue of all Palestinian people,” stressing his support for the prisoners’ just demands. He went on to say, “We belong to this land and we belong to this people who fights for freedom. We will always remain biased to the just Palestinian cause.” The Patriarch and Archbishop joined social activists and supporters all over the world in solidarity with the hunger strikers. While taking one’s own life or causing self-harm is forbidden or discouraged, refusing or abstaining from food as a form of protest, ‘starving for justice” has been practiced from antiquity. People fasted and prayed, Esther interceded and God moved the heart of the king to delivers people and execute justice on those who had tried to manipulate him for their own evil ends. One of the most notable hunger strikes in modern history was carried out by Mahatma Gandhi as part of his passive resistance campaign to obtain independence from British rule in India and as to protest the oppression of the poor. In Europe, hunger strikes were apparently first employed as a method of non-violent protest in pre-Christian Ireland. People would lay themselves at the door of the person from whom they were seeking redress or pardon and remain there in order to arouse feelings of guilt and repentance. The Irish patron, St Patrick is said to have resorted to a hunger strike. One hundred years ago, in 1917, Irish Republicans imprisoned by the British, began hunger striking in order to obtain prisoner of war status. Twelve died as a result. In 1981, IRA prisoners initiated another hunger strike over their treatment in prison. Bobby Sands who led the hunger strike, during which he was elected as MP for the constituency of Fermanagh and South Tyrone, died after 66 days. He became a martyr not just to Irish Republicans but an inspiration to many people around the world struggling for their rights. Arguably the longest and most controversial hunger strike in history has been occurring in Guantanamo Bay. Hunger strikes began there in 2002 in protest at prisoners being held without charge or trial. Despite force feeding, the hunger protests have continued intermittently since. It is known that at least 115 of the 166 prisoners have been on hunger strike at various times. In December 2013, the US military announced that it would no longer disclose information about the hunger strikes, since “The release of this information serves no operational purpose.” It is now known how many are presently protesting in this way. I need to make it clear that in citing these examples of hunger strikers, I am in no way endorsing their actions, or indeed questioning or criticising the grounds on which they may have been imprisoned. 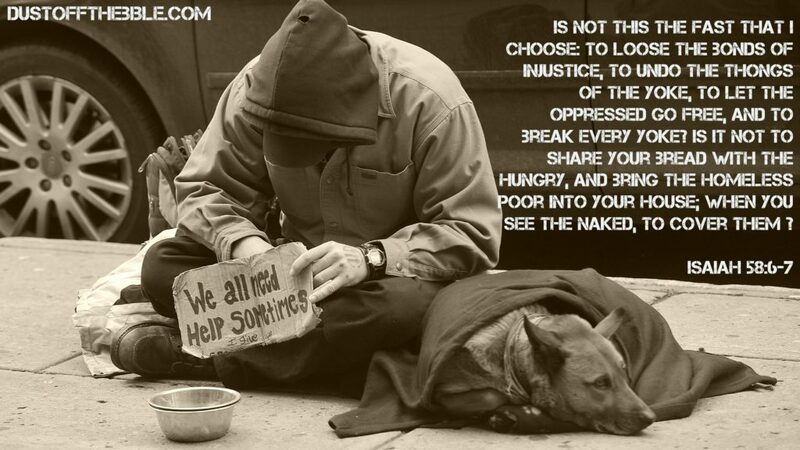 I am merely pointing out that they refused food because of what they and others perceived as unjust treatment. What then are the similarities and differences between purely secular hunger strikes and Christian fasting? What is unique about Fasting for Christians? The tradition of fasting is taught throughout the Bible. The prophets, Moses, David, Elijah, Esther, Daniel all fasted as did the Apostle Paul. Jesus fasted before being tempted by the devil. Although the Christian scriptures do not explicitly command fasting, Jesus assumed his followers would fast. He said “when you fast,” not “if you fast.” (Matthew 6:16). The Christian Church has therefore encouraged fasting as a personal spiritual discipline. Collectively, the forty-days of Lent are intended as a partial fast modelled on the fast observed by Jesus during his temptation, to help Christians reflect on their sins, seek God’s forgiveness and prepare to celebrate Easter. So yes, fasting is a Christian discipline. It is assumed, but voluntary. 2. Why Should Christians Fast? Fasting is the outward expression of an inward hunger for God. Fasting reminds us that we can get by without most things for a time, but we cannot get by without God. The first and main purpose of fasting is to draw close to God. Fasting can help increase our hunger for God. We are so used to giving ourselves whatever we want without even thinking. Out of all the spiritual disciplines, fasting is most like physical exercise. It is both physical and spiritual and it builds our faith muscles so that we can withstand the bigger trials and temptations that come our way. 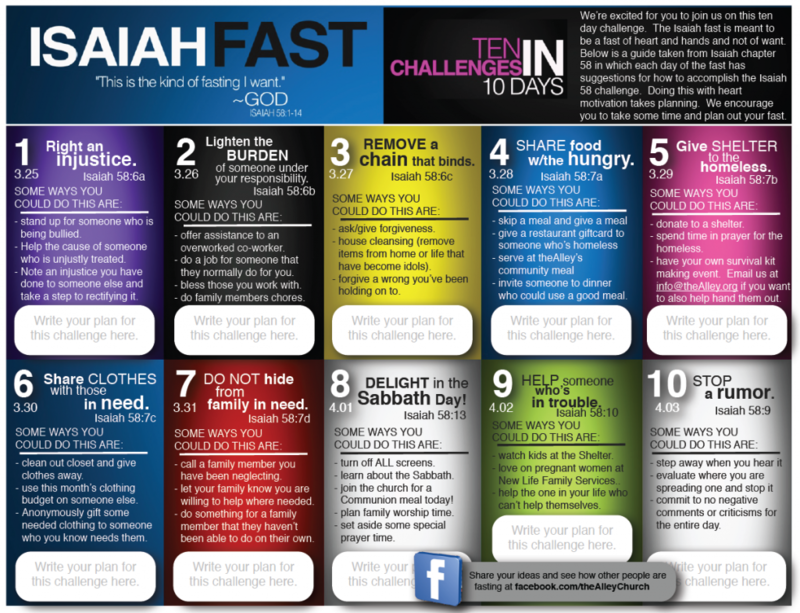 So, fasting can help increase our hunger for God. Fasting can help discipline our bodies. Many people fast when they are desperate for God to answer their prayers. We can fast for rescue from a bad situation, healing of a loved one, direction in life or other requests that are close to our hearts. Fasting can bring a note of urgency to our prayers. We are coming to our Heavenly Father and telling Him (and ourselves) how important he is to us. The person who prays with fasting is giving heaven notice that they are truly in earnest… Not only so, we are using a means that God has chosen to make his voice to be heard on high.” So three reasons why Christians fast: Fasting can help increase our hunger for God. Fasting can help discipline our bodies. Fasting can help purify our goals and priorities. We have asked the questions is fasting Christian and why should Christians fast? What are the Pitfalls in Fasting? In the time of Jesus, fasting was popular on Mondays and Thursdays because those were market days and there would be bigger audiences to see how pious people were. Jesus insisted we should fast in secret. The answer to pride is to fast in secret. There is a heretical tradition in Christianity of punishing ourselves for sins, by denying ourselves food and water. God’s forgiveness of our sins comes with no requirement except confession and repentance. We shouldn’t deprive ourselves of food to punish ourselves or gain favour with God. We already have God’s favour through Jesus. Three pitfalls in fasting – pride, manipulation and penance. 4. What then is the Purpose and Benefit of Fasting? This is the purpose of fasting. Fasting is not about me, or about us. Fasting is not about serving our own interests. Fasting is about how we relate to those who are abused and exploited, especially where we are complicit. Are we eating dates in Ramadan that have been harvested in illegal Israeli settlements in Occupied Palestine? Are we funding colonisation? Are we exploiting the poor? What about our tea and coffee, our chocolate and bananas? Are they fair traded? What about our clothes and shoes? Have they been made by children who should be in school? Do the workers receive a living wage? Fasting should cause us to reflect upon whether we are causing harm or bringing a blessing to others by what we eat, by what we drink, by what we wear or buy. Genuine fasting is about defending the oppressed. It is about caring for the poor and vulnerable. To act in this way is an act of worship. It is to do the very work of God. That is why Jesus fasted – to prepare himself to fulfil God’s will. 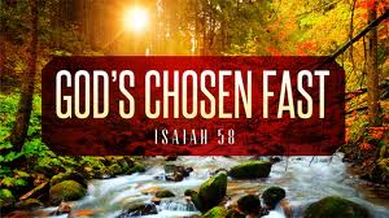 In his first public sermon, after fasting and being tempted by Satan in the wilderness, Jesus took the words of the prophet Isaiah, and applied them to himself. Starting with a three-day fast May 21-23, we will observe a day of fasting on the 21st of each month through until the end of the 115th Congress in December 2018. Again, we are fasting for the protection of poor and vulnerable people from funding cuts and other harmful policies. Budgets are moral documents — they reveal our priorities, who and what is important, and who and what are not. As Christians, we must speak out and stand up against these dangerous policies and cuts. From the example of Esther, we call for a time of public fasting, praying, and petitioning political powers to change or block such unjust actions. It is our faith in a God, who calls us to protect the most vulnerable, that calls us for such a time as this. Wallis is writing about the unprecedented political events in the USA, but his words could just as easily refer to the unprecedented events we are witnessing in the UK this week. This is the kind of fasting God expects and requires. And this kind of fasting comes with a promise. 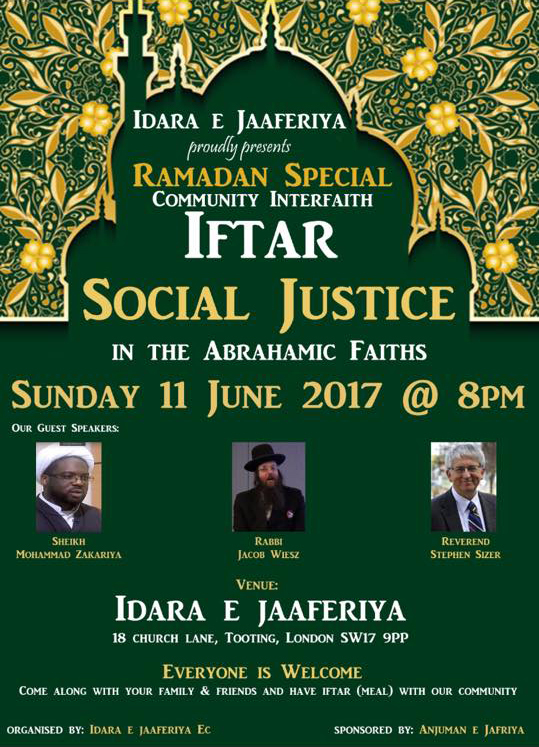 A presentation on Fasting for Justice given at the Idara-e-Jaaferiya, Tooting, last night, promoting religious harmony among the three Abrahamic faiths.